When cycling artist John Etheridge was forced to give up his job through injury he took an executive decision about what to do next. Adopting a ‘nothing to lose’ attitude, he set about creating his own business with a website selling his cycling paintings and greetings cards. Now the on-line cycling world can discover the unique style of an artist who works mostly in pastel and pencil, creating the soft, warm and delicate tones associated with this medium. His pictures include cyclists awheel in the countryside on idyllic summer days, time triallists racing the clock, track riders on the boards and also portraits of top roadmen, including Britain’s greatest Tour de France stage winner Mark Cavendish, winning of course! As well as sport, he does traditional country scenes. Some feature those enigmatic of structures, the windmill; seen through a gap in the hedgerow, or beside the fens. There’s a lighthouse, boats on rivers, and snow-covered fields. There’s one of the shoreline being washed by a stormy North Sea. He’s quite fond of pheasants – there’s usually one or two in view. The one of the cyclist in the country lane depicts a richly plumaged bird in the road. It begs the question, did the bird wait until the rider had passed before waddling into the scene? I found myself waiting to see what it did next, the bird that is? John Etheridge is 47 and his website tells us all about him. He was born in Hillingdon, Middlesex. At one-year old his family moved to Norfolk and the fens. He was still very young when he developed an aptitude for painting. Always sporty, he played football and coached. He was RAF boxing champion. He took up cycling in his late 20s. But he stopped racing after five years, when he rediscovered art. Only recently has he got back into the saddle. Cycling and art remain his two passions in life, he says. 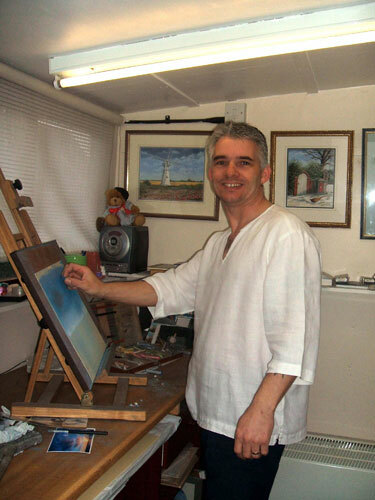 His prize-winning work has been featured in Anglian magazines and newspapers and exhibited at the Royal Norfolk Show.